So that’s the background. Well, a part of it. Now, let’s look at how we are perhaps looking to go forward. We already know that there’s a skills shortage due to a lack of digital skills. Employability is therefore a major driver in what we need to do. So, now we need to consider why, perhaps, UK education is not providing the necessary skills to prepare our students for the future workplace. There are three components to that previous statement. UK education which we’ll define as British education institutions, the students that attend these, and jobs that they will be expected to do in the future. In this blog, we’ll look at a more recent and perhaps more accurate way to look at ourselves and our students in relation to how we engage with digital content and tools and how to identify areas where we can improve. I described in my last blog what, at the time, was the ground-breaking work of Marc Prensky on Digital Natives and Digital Immigrants. A decade later, during which Prensky’s concepts gained much currency as well as attracting a good deal of criticism and doubt, even from Prensky himself, a new typology was formulated to describe the…..techno-educational paradigm….This is Visitors and Residents by David S White and Alison Le Cornu. Age is not the predominant factor, as was argued by Prensky, in how successfully people engage with technology and the Internet, and White and Le Cornu propose an alternative way to map the differing degrees of competence, experience, and engagement with digital technologies, channels of communication and media. White and Le Cornu map people in this context, not on age or technical competence, but based on differing levels and modes of engagement across a continuum between the conceptual modes of Visitors and Residents. At this end of the continuum, you will find the mode of perceiving the Internet as a place full of tools which can be used to complete a particular task. They will have a task, such as requiring the name of a solicitor or paying a bill, and will go online to accomplish that before going back off online again until there is another task that requires a tool that the Internet may offer, crucially, leaving no social trace behind. At this end of the spectrum, you have the mode of looking at the web as a collection of ‘spaces and places’ within which a person can be present with other people. They will have social media profiles and actively engage with other, for example, giving their opinions on blogs and writing their own….such as myself…here…now. White argues that being adept at using the different social media platforms and owning the latest mobile device technologies does not represent having the fundamental ability to use the Internet effectively nor formulate and cogently express opinions online. White states that these skills represent the kind of increasingly important learning literacies, as learning takes place more and more online, that cannot be taken for granted. These are learning literacies that are required to function within the parameters of formal institutional education and beyond into our professional and social lives. So many of us nowadays interact with social media. Do we all exist at the very extreme of this continuum? No, the level of extremity, according to White, relates to the degree to which we find our identity is tied with what we do online. Most people compartmentalise their online personas into activities within specific communities such as Facebook and Twitter. Very few people will live their entire lives online, having little to no friends and interactions outside of what they can accomplish with a keyboard and a mouse. 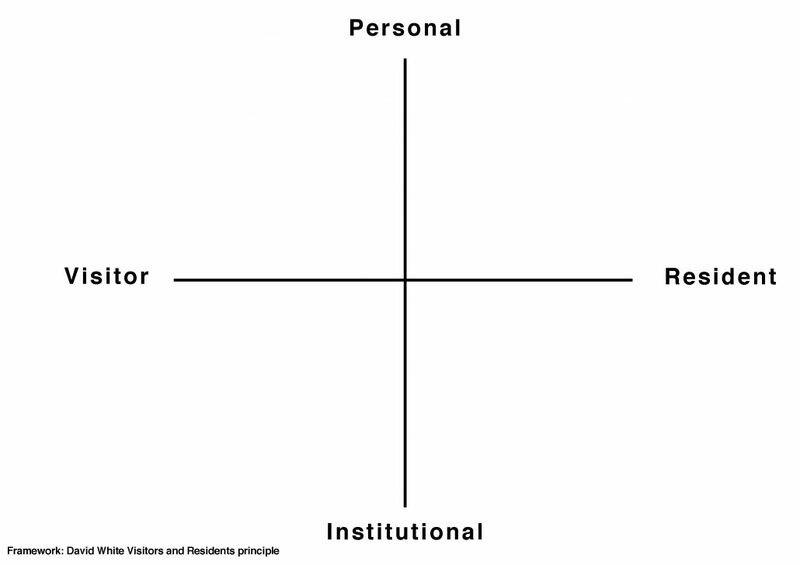 White, therefore, adds a vertical axis to the existing continuum between the concepts of Personal and Institutional and explains that many people’s interactions online as a Resident that are Personal are different to those in more formal institutional contexts such as in education. A lot of people tend to compartmentalize their online identities, ‘work here, studies here, life here’. I myself do this. It has become apparent that I use Facebook for more playful social networking and LinkedIn, Twitter, Google+, and my blog site for more academic and professional pursuits. I have chosen to try and radically limit my use of Facebook. I have done this by removing the Facebook app from my phone and deactivating my account altogether temporarily as a form of habit aversion practice. This may seem rather off-topic, but it is something that is contextually very relevant for a few reasons. 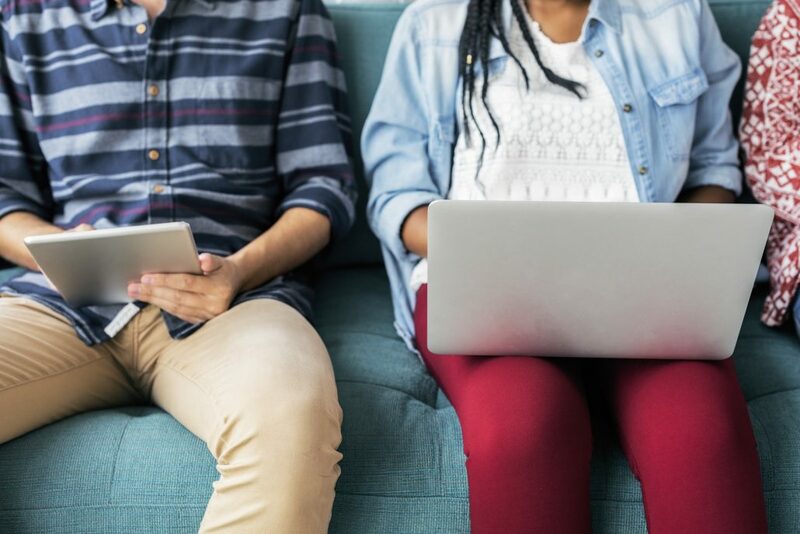 For example, learners in schools, colleges, and universities are increasingly wrapped up in these online lives that may rob them of the necessary time to better accomplish the work necessary to succeed in their studies. They may become stressed out in regards to an ongoing online argument conducted via Twitter. Or, they may be being bullied online. These are all elements that relate to learners that, as part of their lives, occupy a section in the top right extremes of the crossed continuums near both Personal and Resident. Here’s another video where David White demonstrates the Visitors and Residents mapping process, exploring how someone engages with their digital environment. Were an educator to do this, they could first map themselves and then analyse how other staff and learners might engage with what they do. He also discusses how a small focus group of students could also perform this mapping process to provide greater insight into what they do. In combination, this data could provide valuable data and important actionable insights on a number of educational concerns such as how best to reach learners, tailor learning more effectively with the embedding of certain technologies, and identify potential learning gaps in their learning literacies. 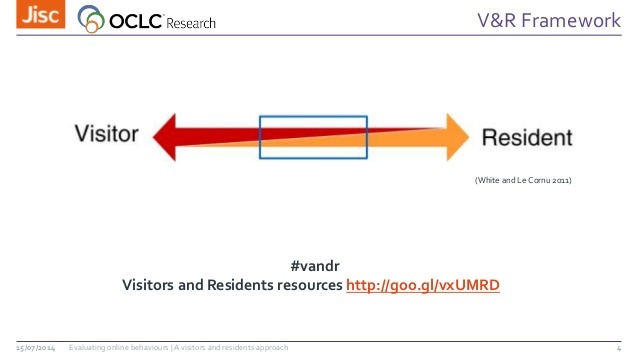 So it’s important to remember that Residents and Visitors is a continuum as opposed to the classification of people into binary positions. It eschews the easier generalisation of Prensky’s Immigrants and Natives metaphor. People can place themselves at any point across this continuum and those that place themselves nearer the Visitor end of that continuum should not be considered to be any less technically adept than those at the Resident end. What this tells us is that we should not take for granted particular levels of competence and engagement of our students and how we can best interact with and plan for those learners we have direct responsibility for. While this exploration of a new typology has provided a nice and simple way for educators to reflect on themselves and get great insights from their students, it doesn’t answer completely the question of who our students are from a broader policy and curriculum perspective. But, where are we now in relation to what we offer those students? In my next blog I’ll look at the results in recent research on students’ feelings towards the digital environment, tools, and practices offered by their educational institutions. Digital Competence – the Background Digital Storytelling 106 – Why is this MOOC so important?